When Graff and Altreda, good aliens brought to Earth to protect humans from bad aliens are killed by The Prayer, Daniel X is orphaned at 3. Now fifteen, Daniel has followed in his parents footsteps as an Alien Hunter, seeking out the bad aliens on The List of Alien Outlaws on Terra Firma. Daniel has been discovering his alien powers: smelling alien sweat from ten miles away, and making high performance hybrid engine racing bikes that can travel 3,000 miles at 75 mph on a gallon of gas. But his coolest power of all is his ability to create his alien best friends Willy, Joe, Emma and Dana – as well as his dead Mom, Dad and sister, Pork Chop – out of his imagination. 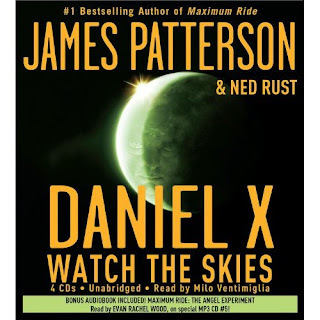 Read the rest of Broad “A’s” book review of “Daniel X: Watch the Skies”. Book Group we’ve got 3 to giveaway to our readers. REMEMBER – you can enter DAILY!! * This giveaway is open to US residents, 18 and over and ends on August 15, 2009 11:59 EST. I subscribed to this site. I loved You've Been Warned! I really like James Patterson and would love to have this to listen to on our next trip. How can you pick a favorite James Patterson book it is next to impossible each one is better than the last! Lindsey is a great character if you ever needed a detective she would be the one for you.